Passengers alighting at Amsterdam Airport have a few options to their final destination: they can wrestle their luggage onto the train, or wait in line for a taxi or black cab, or find some poor schmuck who's willing to battle Amsterdam traffic to get them home of to their hotel. A new 24/7 airport shuttle service by Holland Limousine Services, however, offers an alternative that promises to be less aggravating, but won't cost or impact the planet as much as a private rental car. 2. Same as above but then Roundtrip Transfer In- and Outbound. P/U time on outbound transfer 2,5 hrs prior to flight departure time Cost: â‚¬39,00 pp incl. 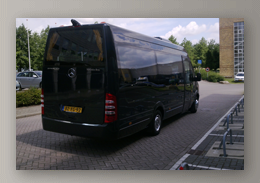 VAT Customers are met with Name Board (Holland Limousine Shuttle Service): "Name Travel Agent" or whatever is agreed, at the meeting point in Arrival Hall Amsterdam Airport/Cruise Terminal etc. All chauffeurs are uniformed and multilingual. Our chauffeurs will inform passengers of local attractions and any information you may wish us to give to your customers.